Tooth enamel is the strongest substance in the human body, but that doesn’t mean that it’s not prone to decay. 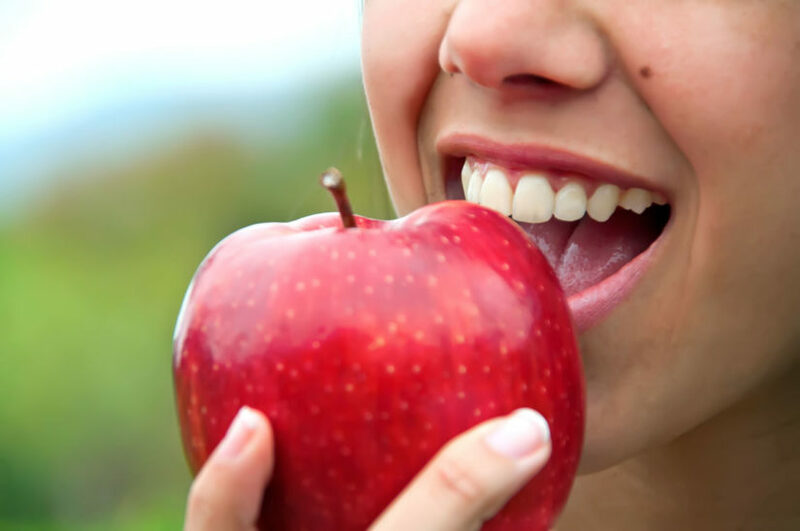 Your teeth are constantly subjected to destructive substances, like the sugar and acids found in your food, as well as the risks of damage and injury. You may not even notice your tooth enamel has worn down, so here are some things to watch out for and what you can do about preventing enamel loss. Tooth enamel is the hard outer substance of the tooth that protects the softer and more sensitive inner tooth, called dentin. If the enamel is exposed to destructive bacteria bred from sugars and starches, or to acids from citrus fruits and coffee, for example, the substance starts to break down. This is why it is so important to properly brush and floss your teeth at least twice each day to make sure that these harmful substances don’t stay in contact with your tooth enamel for too long. Enamel can also be lost due to tooth damage or oral injury. Chipped or cracked teeth can expose the inner part of the tooth, making it vulnerable to decay without protection from the enamel. Teeth clenching and grinding also wears down tooth enamel, so be sure to ask your dentist about teeth protection if you are prone to this. Once enamel is lost, the body does not replace it, which is why preserving it is so important. What does enamel loss look like? Enamel loss can appear in various ways including discolouration, sensitivity when consuming hot or cold foods and drinks, and teeth that more easily chip or crack. As soon as you notice any of these symptoms or otherwise suspect that you are suffering from enamel loss, tell your dentist so you can address the issue right away before it progresses. How can I replace my lost enamel? As mentioned before, once enamel is lost it cannot be replaced. But weakened enamel can be salvaged through a process called remineralization, which replaces lost minerals in the enamel, making it strong once again. Products with fluoride, like fluoridated toothpaste and foods high in calcium, are great for aiding in remineralization. Fluoride acts as a barrier between your teeth and destructive substances like sugars, starches, and acids, protecting the weakened enamel and your teeth. For specific advice based on your enamel loss, make sure to speak to your dentist about the best solution for you and your teeth. What happens if my enamel is gone? Without enamel, the sensitive part of your teeth is exposed and vulnerable to destructive substances, much more susceptible to breakages, and can become extremely sensitive and painful. Because the enamel protects the inner part of the tooth, without it, teeth would deteriorate and decay very quickly, resulting in oral pain, tooth loss, infection, and likely gum disease. For mouths with advanced enamel loss, artificial teeth may be installed as a solution to ward off further decay from teeth, gums, and the overall jaw structure. How can I prevent enamel loss? Flossing and brushing twice every single day with fluoridated toothpaste is the easiest and most effective daily prevention method to combat and prevent enamel loss. Using a mouthwash that fights against enamel loss can also be a great addition to this routine, and will provide extra protection throughout your day. And, of course, visiting your dentist every six months for a professional cleaning is a key step in ensuring that your entire mouth gets a regular cleaning, by targeting hard to reach areas where destructive bacteria can dwell. If you are looking for a dentist who specializes in enamel loss and solutions, check out 123Dentist’s list of dental professionals to find your perfect fit.